A debut novel about Lizzie Borden - what more could you really ask for?! Scroll on down for a synopsis and our varied reviews. Everyone has heard the story about Lizzie Borden and we all know the rhyme that goes with her story. 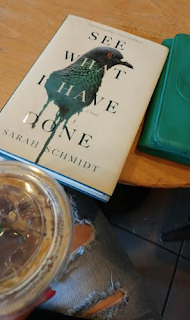 Sarah Schmidt goes further in her debut novel and gives us a behind the scenes look at the Borden family, and as we can all imagine, it's not a pretty picture. It's 1892 and Lizzie has found her father dead. 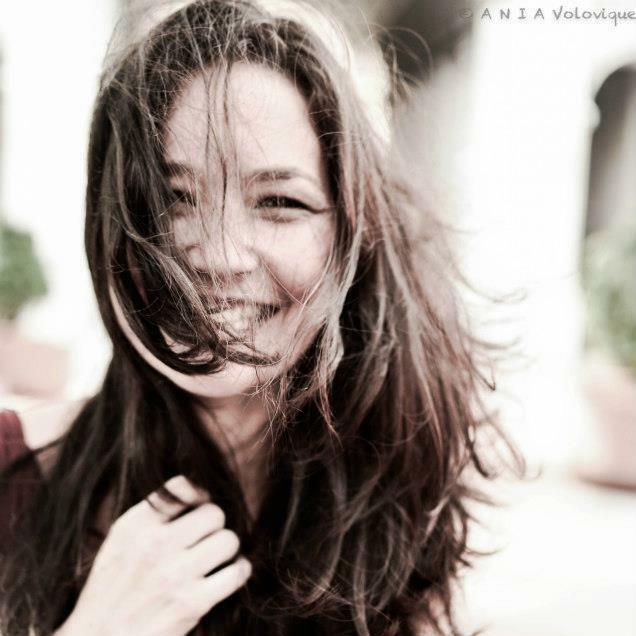 As the police investigate and question her, we are taken back to her life growing up. She's quite the interesting child, with a morbid curiosity and a love for pigeons. Her relationship with her parents is rough as she wants to rule the roost but they won't have any of her lip. Her relationship with her sister, Emma, is also unhealthy and we see how Emma has always taken care of Lizzie, to her own detriment and not without being resentful of all her time wasted. Bridget, the maid, sees and hears the most in the family. She continually cleans up after everyone, hiding all their little secrets. Could she have prevented this atrocity? Or is Benjamin, hired by their uncle, the cause of this bloody mess? Taken from each of their POVs, we get an inside look to the relationships build that ultimately led to a gruesome murder. It also explains why it took so long to even look at Lizzie as a suspect. The author really paints quite the picture in this fictionalized version. Many scenes are replayed through the eyes of each of these 4 people, giving some repetition throughout the book. It did confuse me in a couple of sections but I was riveted. As someone who has always been fascinated by this story, I was thrilled to get a book that delved into what their story might have been. The ending where they do a timeline was probably one of my favorites. If you are in any way fascinated by Lizzie Borden and her axe that whacks, you'll love this story. If you're not sure, but like historical fiction based on true events, GET IN! "Lizzie Borden took an ax and gave her mother forty whacks. When she saw what she had done, she gave her father forty-one. Or did she?" How could I not be instantly drawn into SEE WHAT I HAVE DONE by Sarah Schmidt? This was a historical mystery/thriller and I could not put it down. It had an eerie vibe for the entirety of the book - like something wasn't quite right. It's August of 1892 and Lizzie Borden finds her father dead. All she can say to their maid is that someone cut him. While everyone around her panics, Lizzie remains eerily calm throughout the ordeal. A short time later that same day, they find her stepmother dead in her room. Who could have possibly killed them? We switch perspectives between Lizzie, her sister Emma, Bridget the maid, and Benjamin. We have flashbacks from each character and it definitely paints quite the picture of who they are and how they came to be that way. Emma resenting her younger sister and hating her for keeping her tied to their home. The relationship between Lizzie and her late father and stepmother. Bridget and how she came to end up at the Borden's home. Then finally, Benjamin. A man hired by the girls' uncle - how does he tie in? If you like a good thriller and mystery that has that constant eerie feeling throughout, then you need this one. This book kept me turning pages and second guessing who I thought had done it. One thing is for sure, Lizzie is crazy. Her chapters were so interesting to read and hear her thought process about the entire ordeal. I highly recommend this one and completely see why it's getting all the buzz that it has been. 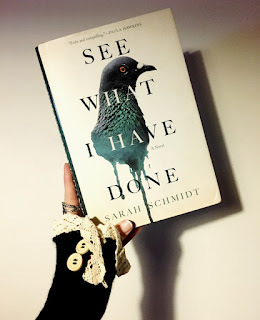 I had heard of Lizzie Borden before but had never really given much thought to her actual trial until I began See What I Have Done by Sarah Schmidt. One of #cjsreads first August picks, I wasn’t 100% sure what to expect when I dove into this book. Generally speaking, I enjoy historical fiction but struggle when it has a mystery/thriller angle. I don’t know what it is about them, but they all feel a little “Sherlock Holmes” to me. 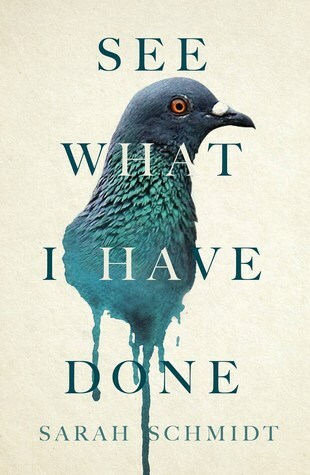 However, with a cover quote by Paula Hawkins stating this book was “eerie and compelling” I was intrigued right away. I would have to say that I agree with Hawkins on this one; See What I Have Done had an ominous vibe throughout. Opening with Lizzie discovering her father dead in his study and going back and forth between the day of the murder and the days prior, the investigation into the murder begins and it doesn’t take long for Lizzie to be at the center when she begins to seem unreliable and struggles to remember events of the day. With her sister by her side and the police closing in, the novel is narrated through multiple character perspectives including a stranger and a housemaid. The first thing that stood out for me while I was reading was how irritated I was with the multiple character perspectives. I didn’t care for the various POVs; I felt like I wanted to hear the story through the eyes of Lizzie and all the other characters felt a little bit irrelevant to me. I know they all played their role but I think I would have been completely consumed with the plot should it had been through Lizzie’s unreliable narration. I love me an unreliable narrator! 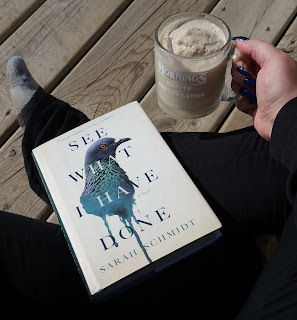 I was impressed with how Schmidt was able to take a real scenario and turn it into a fictionalized account without making it seem over-embellished or too far-fetched. I feel like it was kept realistic and took more of a rational approach. This was a smart decision on Schmidt’s part. I felt like I was truly reading more a “true crime” story instead of a work of fiction. Overall, I felt like this was an entertaining read but, like some other historical mysteries, I found this one to be quite slow moving. If you are at all interested in Lizzie Bordon, this will obviously appeal to you and I also feel like fans of true crime will have a special interest in this tale. However, if you are looking for something incredibly fast paced, then I would skip this one! I gave it 3/5 stars. Big thank you to Grove Atlantic for these copies in return for our honest opinions.